Conducts research into general hydraulic, coastal and river engineering problems. The Center is Canada's largest and best-equipped civil engineering hydraulics facility. Facilities include three wave flumes, a multidirectional wave basin, a shallow water wave basin a high-discharge flume, a tilting flume, weigh tanks, and an ice tank/cold room. 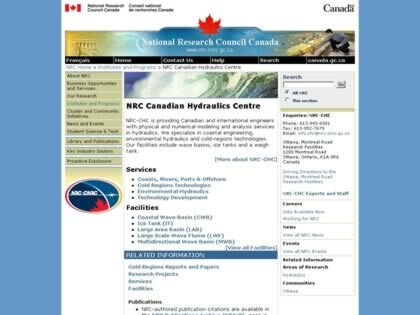 Web Site Snapshot: If available, above is a snapshot of the Canadian Hydraulics Center, National Research Council web site at http://www.chc.nrc.ca/ as it appeared when this site was added to the directory or last verified. Please Note that Boat Design Net has no involvement with the above web site; all content and images depicted in the above thumbnail are the property and copyright of Canadian Hydraulics Center, National Research Council unless otherwise noted on that site. Description: Conducts research into general hydraulic, coastal and river engineering problems. The Center is Canada's largest and best-equipped civil engineering hydraulics facility. Facilities include three wave flumes, a multidirectional wave basin, a shallow water wave basin a high-discharge flume, a tilting flume, weigh tanks, and an ice tank/cold room.